15" x 1-3/8". Low-profile LED tail light serves 3 functions on trailers over 80" wide. Durable polycarbonate housing and lens. Surface mount - hardware not included. 3-Wire design. Lowest Prices for the best trailer lights from Optronics. Thinline LED Trailer Tail Light - Stop, Tail, Turn - Submersible - 11 Diodes - Red Lens part number STL69RB can be ordered online at etrailer.com or call 800-298-8924 for expert service. 15" x 1-3/8". 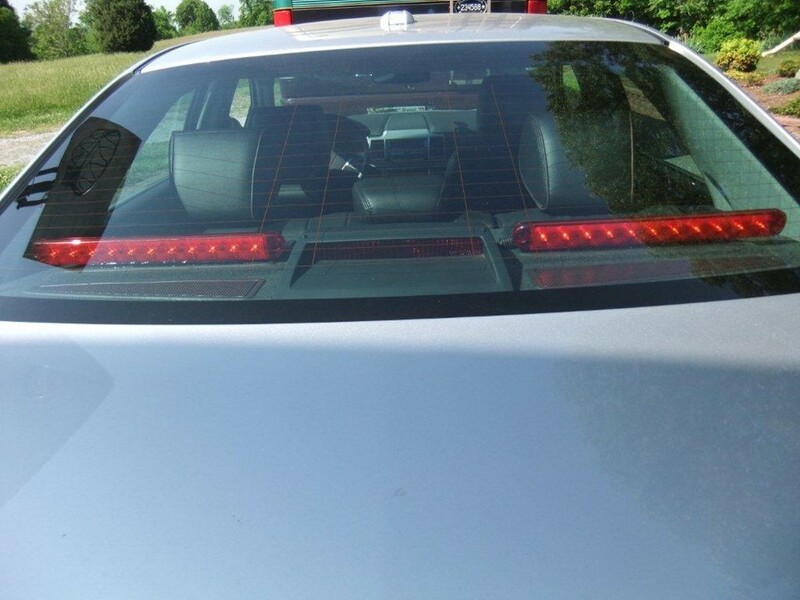 Low-profile LED tail light serves 3 functions on trailers over 80" wide. Durable polycarbonate housing and lens. Surface mount - hardware not included. 3-Wire design. Distance between mounting hoels (center on center): 14-1/8"
6-1/2" Oval. Waterproof trailer light serves 3 functions: brake, tail, and turn. Smooth X-shape crosses the face of the light. Recessed mount with grommet (sold separately). Accepts industry-standard 3-prong plug. 20-1/2" Long x 1" tall. Waterproof trailer light serves 3 functions: brake, tail, turn. Low-profile Thinline light fits in tight spaces. Surface mount on 19-5/8" centers - hardware not included. 15 LEDs. Red lens. Today we're going to review part number STL69RB. This is the Optronics sealed thin line LED trailer stop, turn, and taillight for over-80"-wide trailers. Now this is a red rectangular trailer light, serves three functions for trailers that are more than 80" wide. It's the stop, turn, and taillight functions. This is a great replacement for incandescent lights because there's no bulbs to have to be replaced, no brittle filaments to break. It is waterproof and corrosion-resistant. Does have 11 red LEDs. It is a surface-mount. You can see the hole on each to choose for mounting this. At the very back you can see it is a three-wire design which contains the red and black which are the power wires, and then the white which is a ground wire. Few dimensions on this. Overall width edge to edge is going to be right at 15". The height of it is going to be right at 1-3/8". The depth of it is right at 5/8" deep. The mounting holes center to center going to measure right at 14-1/8". Now this LED light will draw .270 amps for the stop and turn signal and .025 amps for the taillight signal at 12.8 volts. This light is DOT approved. Comes with a lifetime warranty on the LEDs. Now what I am going to do is we're going to attach the three wires to a power source here. Going to show you how to brightness of the light and the functions that it has. We'll go ahead and hook up the white wire, which is the ground. We'll go ahead and hook up the red wire, which will be the stop and turn. Then we'll go ahead and hook up the black, which would be the taillight function. With those all hooked up I'll go ahead and turn off the overhead lights, go ahead and turn on the power. You'll be able to see there's the 11 LEDs for the taillight function. Then when the brakes are applied you can see a lot bright for the brakes. Then when you do the turn signals you can see the turn signal function. Now I'll go ahead and turn off our power, turn back on our overhead lights. That should do it for the review on part number STL69RB. 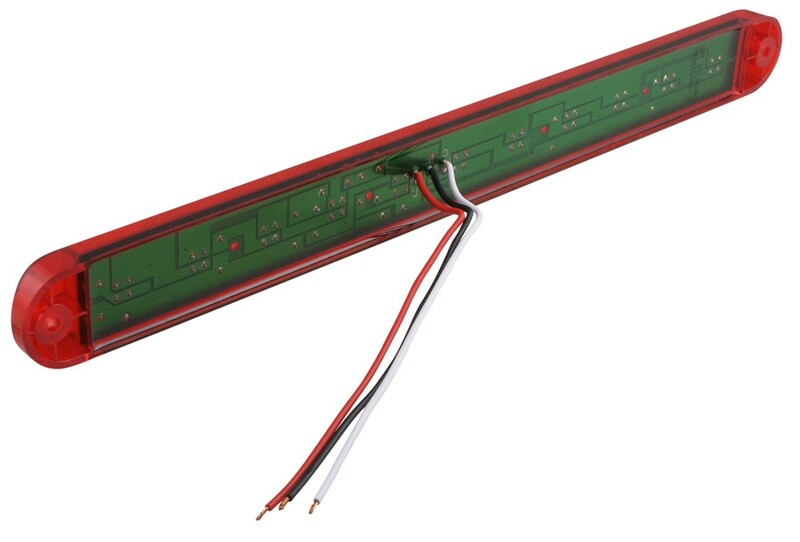 This is the Optronics sealed thin line LED trailer stop, turn, and taillight for over-80"-wide trailers. .
Order: RelevanceNewestRating - High to LowRating - Low to High 15" x 1-3/8". Low-profile LED tail light serves 3 functions on trailers over 80" wide. Durable polycarbonate housing and lens. Surface mount - hardware not included. 3-Wire design. They are working great! And look sharp on my trailer! They were easy to install and made the trailer look modern! HI Patrick. The slim Line lights are working good!! A lot of People tell me how nice the lights look on my cushman 3-wheeler!!!! THANKS AGAIN E-TRAILER!!!! KEEP UP THE GOOD WORK!!! DENNY W. SPARTA WI.!!!! 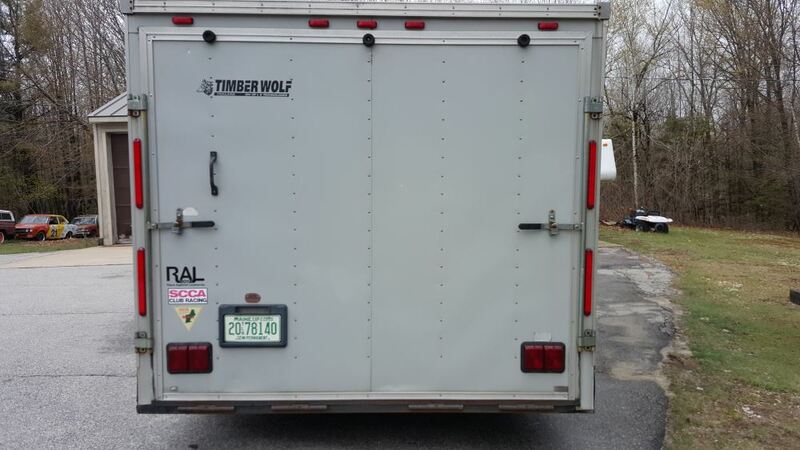 The STL69RB Thin line taillight would wire up as follows: the white wire is the ground connection, which should connect to the trailer frame or a metal structure thats attached to the trailer frame. 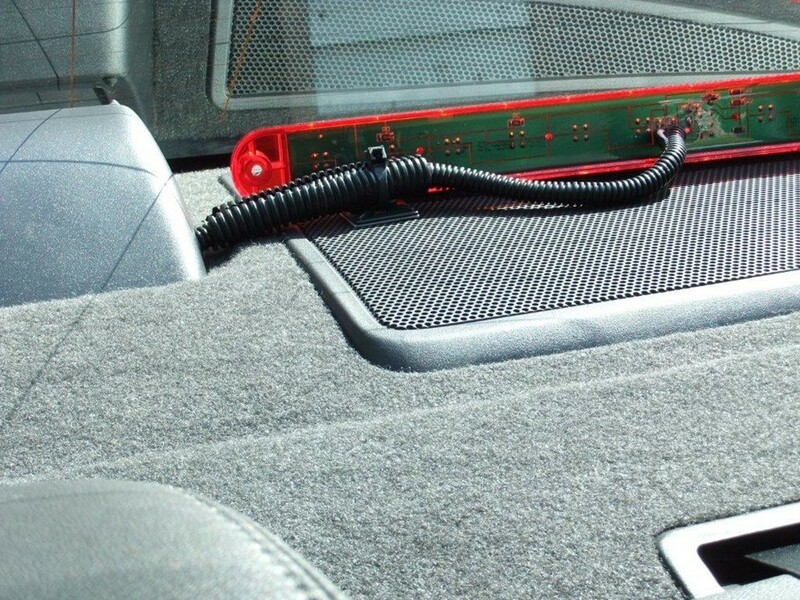 The red wire connects to the brake lamp/turn signal circuit and the black wire connects to the running light circuit. I purchased the lights to replace damaged ones on my motorcycle trailer. I think they are great, low profile, easy to install and reliable. Great, never have had any problems. My father hasnt had any issues with the parts. Installing them was a snap, and they are a good quality product. Happy Holidays! Hi patrick. The Lights are working out really good and they look so awesome!!!! thanks again!!! Denny!!! If i need lights or other things you people have ,you will be the folks i will come to. KEEP UP THE GOOD WORK!!! After a year, the lights still work like new! We don't carry lights with those colors, so you will need to test them based on function. Normally black and red are power and white is ground like you see in the # STL69RB. I would try the yellow as ground. Red is most likely the turn signal and brake function and black is most likely the constant running light. 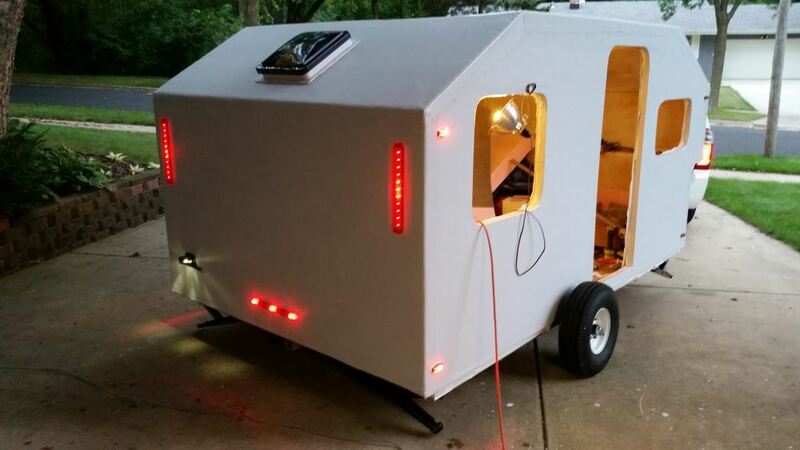 The Optronics Trailer Lights # STL69RB that you referenced is sold individually. If you needed a quantity of 2 you would need to enter 2 into the quantity box before hitting add to cart. You might also be interested in purchasing the chrome base for this light, part # A69CB. The only difference between the two is the height of the lamp. The Optronics # STL69RRXB is 15 inches long by 1-5/8 inches tall, while the # STL69RB is 15 inches long by 1-3/8 inches tall, a 1/4 inch difference. Other than that, both lamps are pretty much identical. We have a long, thin trailer tail light with a chrome base, but the Optronics Thin Oval LED Tail Light, # STL76RB, does not have a chrome base option. Another light that you may be interested in is the Optronics Sealed Thin Line LED Trailer Light, # STL69RB, and the Chrome Base, # A69CB.